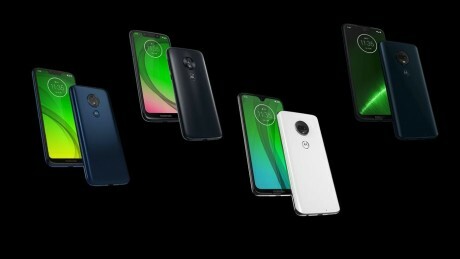 A Brazilian Motorola web site accidentally posted photos and details of the unannounced Moto G7 series of phones. There will be four versions of the G7. All of them have a headphone jack, fingerprint reader, memory card slot, and Android 9 (Pie). The standard Moto G7 model will have a 6.24" full-HD+ display with a small "drop-style" notch, and dual rear cameras. Inside is a Snapdragon 632 processor paired with 4 GB RAM and 64 GB storage, and 3,000 mAh battery. The Moto G7 Plus model is very similar but has a Snapdragon 636 processor and higher-resolution cameras (16 megapixel main / 12 megapixel selfie). A slightly lower-end Moto G7 Power has a huge 5,000 mAh battery, but has a lower-res (720p) HD screen with a larger notch, less internal storage, a single rear camera, and 3 GB RAM. The cheaper-still Moto G7 Play is similar to the G7 Power but with a smaller 5.7-inch display, 2 GB RAM, and a 3,000 mAh battery. An event is scheduled for Feb. 7 in Brazil where the G7 series is expected to be formally announced. Motorola's third-generation Z Play brings the series up to speed with its competition. This mid-range Android phone switches to a 2:1 screen shape and offers a fingerprint reader and face unlock for security. The Moto G6 Play from Motorola is a low-cost device with a big screen and a big battery. It has an attractive design with mostly entry-level specs.